St Kilda Road, the boulevard leading south from the city, being the road reserve commencing at Princes Bridge, Melbourne to a point close to Henry Street, Windsor near the St Kilda Junction, including the roadway, medians, garden beds, kerbing, footpaths, trees, the Edmund Fitzgibbon Memorial, and a single lamp post on the east median, south of High Street. 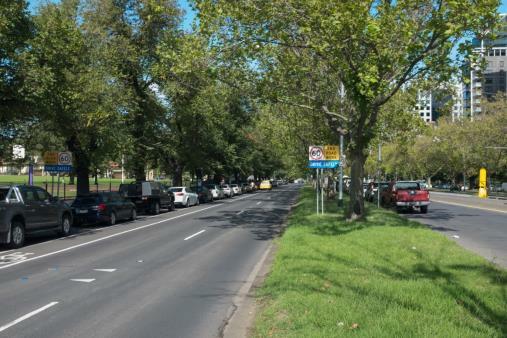 St Kilda Road developed from Baxter's Track which led from Melbourne to Baxter's Stockyard in St Kilda from the 1830s. As early as the 1840s, the east side of St Kilda Road was chosen as the location of public institutions, such as the first Immigrants Home, and Governor La Trobe had reserved a site for a Government House in the nearby Domain by 1840. By the early 1850s St Kilda Road was a main thoroughfare and more institutions were built along it, such as Victoria Barracks (1856-72), Melbourne Grammar School (1856), the Observatory (1861) and the School for the Blind (1866). In the mid-1870s, the first allotments along St Kilda Road, near Fawkner Park, were auctioned for residential development. 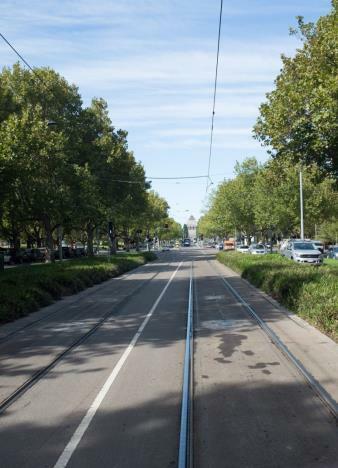 Improvements were undertaken to St Kilda Road in the late 1880s, prompted by the introduction of cable tramways along the length of the road in 1888. The road was soon after referred to as a 'boulevard'. 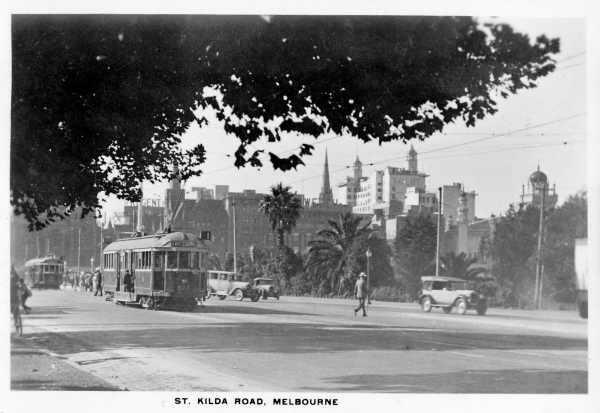 The ceremonial and symbolic importance of St Kilda Road was enhanced with the construction of the Shrine of Remembrance in 1934 which incorporated the vista along St Kilda Road and Swanston Street. With the 1950s rezoning of land along St Kilda Road to allow for non-residential development, the character of the built form along St Kilda Road began to change, with the demolition of nineteenth century residences and construction of commercial and office buildings. The road itself has remained a boulevard, and community appreciation of it continued into the late twentieth century. 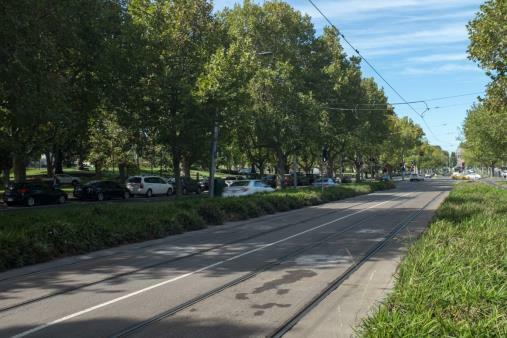 St Kilda Road continues to be the southern gateway to Melbourne and an important thoroughfare connecting the southern suburbs with the city, and it retains its role as a location for public ceremonies, such as the annual Anzac Day parade, and gatherings. St Kilda Road, Melbourne is approximately four kilometres in length. 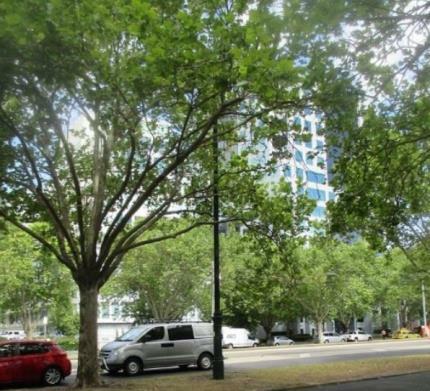 It is a tree-lined boulevard which includes the road reserve commencing at Princes Bridge, Melbourne to a point close to the intersection with Henry Street, Windsor near the St Kilda Junction. It includes a wide carriageway, comprising a central roadway with tram tracks, flanked by medians, outer traffic lanes, and wide footpaths. 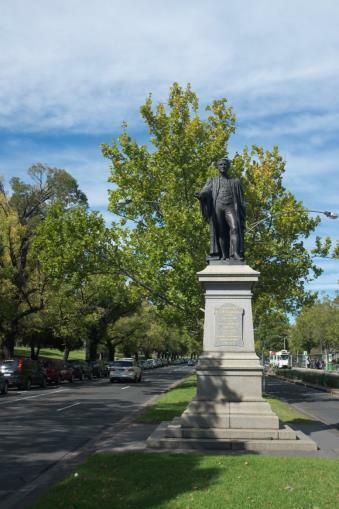 St Kilda Road has important views to the Shrine of Remembrance, and the 1908 memorial to Edmund Fitzgibbon is located on a median near the intersection of St Kilda Road and Linlithgow Avenue. For much of its length between Linlithgow Avenue and High Street the central roadway and outer traffic lanes are separated by median plantings of Plane Trees (Platanus × aceriflolia). There are border plantings of Elms: Ulmus procera (English Elms), Ulmus x hollandica (Dutch Elms) and Ulmus x hollandica 'purpurascens' (Purple-leaved Dutch Elms) along the east and west edge of the outer traffic lanes. 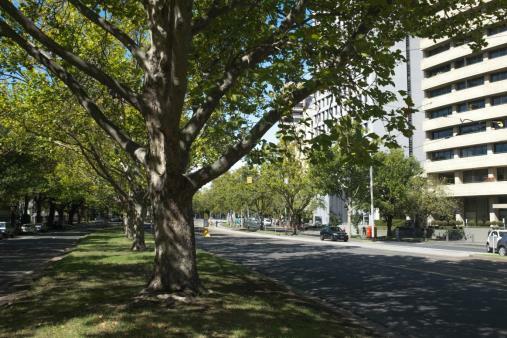 Plantings along St Kilda Road vary in age with most trees either mature to over-mature. 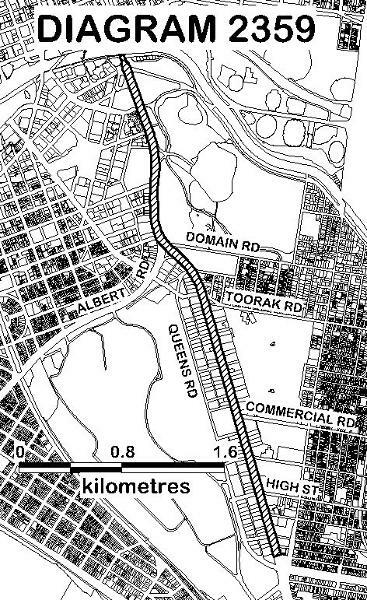 All of the place shown hatched on Diagram 2359 encompassing St Kilda Road, being the road reserve commencing at Princes Bridge, Melbourne, at the southern boundary of Crown Allotment 2021 Parish of Melbourne South to a line drawn from the south-western corner of Lot 5 on Lodged Plan 33497 (649 St Kilda Road) perpendicular to the alignment of St Kilda Road. 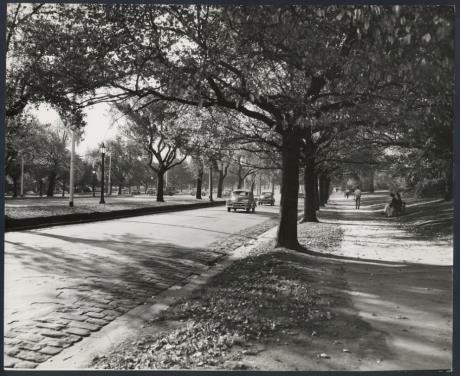 St Kilda Road developed from an 1830s track known as Baxter's Track, a bush track which led southwards to the St Kilda Hill and Baxter's Stockyard at the corner of Robe and Acland Streets. As early as the 1840s, the east side of St Kilda Road was chosen as the location of public institutions. The first Immigrants Home was established in the early 1840s near the Yarra River and Governor La Trobe had reserved a site for a Government House on an elevated location on the Domain by 1840. In 1842, the first sales of Crown land at St Kilda took place, and an 1843 advertisement made an early mention of a track to St Kilda from Melbourne. By 1847, residents of St Kilda and the Melbourne Corporation had agreed to donate £25 each towards improving the 'highway' from St Kilda to Melbourne, although little was done until the 1850s. St Kilda Road was also known as the Brighton Road in this period, with the growth of Brighton also influencing the road's use and development, with coach services connecting both localities to Melbourne. The first stone bridge crossing the Yarra River was opened in 1850. In 1853, the Melbourne Central Road Board instructed an engineer to survey St Kilda Road from Princes Bridge to St Kilda Junction with a view to improvements. The Roads Act of 1853, which provided for wide roadways for a number of radial routes from Melbourne, indicates that the then Surveyor-General Robert Hoddle envisaged the growing town as a future city. 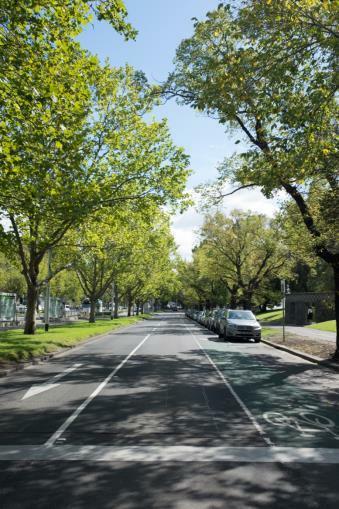 St Kilda Road was a main thoroughfare by the early 1850s and the 1853 Roads Act designated its 3 chains (60m) width. The line of the road can be seen on a plan of 1858, and broadly reflects the existing alignment. Further institutions were established along St Kilda Road in the 1850s and 1860s, including the Military Barracks (1854); Melbourne Grammar School (1856); the Observatory (1861); Wesley College (1865); the Deaf and Dumb Institute and School for the Blind (both 1866). Government House was constructed off St Kilda Road in the Domain parklands in 1871-75, and the Jewish Almshouses near St Kilda Junction were established in 1870. Likewise, the Domain parklands were developed at the northern end of the road through the nineteenth century. In 1867, the northern end St Kilda Road was used as part of the ceremonial route from Sandridge (Port Melbourne) for the arrival of the Duke of Edinburgh to Melbourne. Historian Judith Buckrich recounts how: the procession had fifty carriages and as it wound into St Kilda Road it was met by a group of schoolboys, including a contingent from Wesley College who presented arms. Closer to the bridge, the women at the Immigrants Home were standing on raised benches especially erected so they could see easily the Prince and procession. In the mid-1870s, the first allotments along St Kilda Road, near Fawkner Park, were auctioned for residential development. With the 1950s rezoning of land along St Kilda Road to allow for non-residential development, the character of the built form along St Kilda Road began to change, with the demolition of nineteenth century residences and construction of commercial and office buildings. However, the road itself has retained its boulevard arrangement, and community appreciation of it continued into the late twentieth century. In the twentieth century, the National Gallery and the Victorian Arts Centre were constructed on the west side of St Kilda Road, continuing the nineteenth century preference for important public institutions to be located along it. 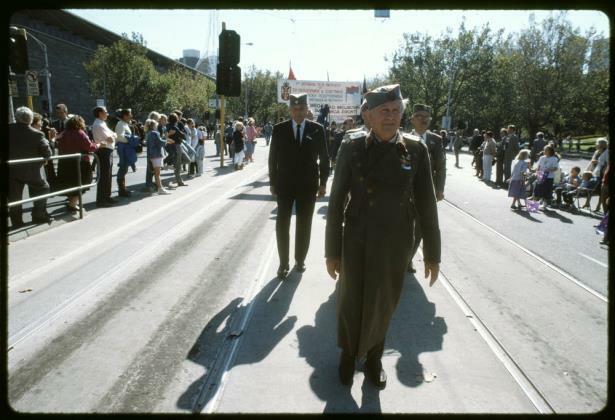 St Kilda Road continued to be used for commemorative purposes through the twentieth century, including the annual Anzac Day marches from Swanston Street to the Shrine, protests and Moomba Parades. In both 1996 and 1999, there were campaigns to the City of Melbourne to rename the thoroughfare St Kilda Boulevard, to give St Kilda Road the 'status it deserved', although both were ultimately unsuccessful. Judith Buckrich, Melbourne's grand boulevard: the story of St Kilda Road, State Library of Victoria, Melbourne, 1996. Lovell Chen, Nomination Of St Kilda Road to The Victorian Heritage Register, Supporting Documentation, Prepared for Melbourne Metro Rail Authority December 2015. One of Melbourne's grandest major thoroughfares, this 1850s tree-lined boulevard is an iconic part of Melbourne's urban landscape. With sweeping views between the Shrine of Remembrance and the Melbourne CBD, it has been used for important ceremonial and celebratory processions.
. The process of gardening, including mowing, hedge clipping, bedding displays, removal and replanting of shrubs, disease and weed control, and maintenance to care for existing plants.
. The removal or pruning of dead, dying or dangerous trees as assessed by a qualified Arborist to maintain safety. If the tree is identified as being of primary or contributory cultural heritage significance, the Executive Director must be notified of these works within 21 days of them being undertaken.
. Subsurface works involving the installation, removal or replacement of watering and drainage systems or services outside the canopy edge of significant trees in accordance with AS4970 and on the condition that works do not impact on archaeological features or deposits.
. Tree planting (with same species) and replacement trees for any tree removed in accordance Australian Standard; Tree stock for landscape use AS 2303:2015.
. Nature strip works involving porous hard and soft surfaces that include rock pave, concrete or bluestone edges, grass and granitic sand, outside the tree protection zone.
. Median strip works involving porous hard and soft surfaces that include rock pave, concrete or bluestone edges, grass and granitic sand, outside the tree protection zone.
. All works to maintain the existing roadway and road safety including road surface, shoulder and footpath maintenance, kerbs and channel repairs, road line marking (including for bicycle lanes), speed humps or platforms, pedestrian refuges and splitter islands or separators within the existing roadway, and the installation of pedestrian crossings, traffic signs, signals and associated infrastructure, fire hydrants, drains, parking meters and post boxes. This exemption does not include the replacement of any bluestone kerbing or guttering/channels.
. Repairs and maintenance to hard landscape elements, structures, sculptures, statues, memorials, rockwork, steps, paths, gutters, drainage and irrigation systems, edging, fences and gates and lighting.
. Repairs and maintenance of culverts, kerbs, gutters, drainage works, pavement marking and traffic signs.
. Repairs and maintenance of existing crossovers, driveways and paths that do not require the removal or lopping of trees and significant vegetation.
. Repair, maintenance and replacement of traffic signals and signage.
. Repairs and Installation and maintenance of services in roadways and footpaths. However works that would impact on any part of place such as any landscaped areas, verges, median strips, nature strips, trees and tree roots may require either a specific permit exemption or permit approval.
. Maintenance, removal or installation of underground utilities if outside the tree protection zone.
. 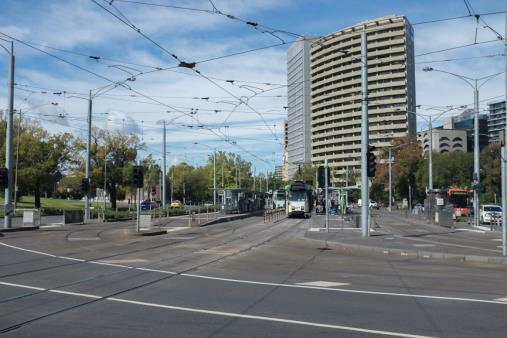 Repairs and maintenance of existing tramway infrastructure, including tram stops, barriers, signage, platforms, shelters, overhead wiring and tram poles.
. Repairs and maintenance of existing bus infrastructure, including bus stops.
. Installation of standard City of Melbourne and City of Port Phillip street furniture, including seats, bins, signage, bollards, lights and drinking fountains which has no negative impact on the cultural heritage significance of the place.
. The placement of removable tables, chairs, umbrellas, heaters, and non-permanent wind screening and barriers necessary for the operation of hospitality/cafe/restaurant businesses along St Kilda Road. This excludes awnings.
. Preparation for and delivery of City of Melbourne and City of Port Phillip events (including the Anzac Day Parade, White Night, the Moomba Parade and other events delivered by external organisations approved by the City of Melbourne and the City of Port Phillip) for a period of up to 7 days, including the temporary erection of infrastructure that has no negative impact on the cultural heritage significance of the place.
. Events of a longer period or having the potential to impact on the road, trees, median strips, footpaths and features will require the submission of a management plan to be approved by the Executive Director. In this case the event would normally be considered under the Minor Works provisions of the permit exemptions and s66. (3) Heritage Act 1995. The extent of registration of St Kilda Road in the Victorian Heritage Register affects the whole place shown on Diagram 2359 including the land, all buildings, roads, trees, landscape elements and other features. Under the Heritage Act 1995 a person must not remove or demolish, damage or despoil, develop or alter or excavate, relocate or disturb the position of any part of a registered place or object without approval. It is acknowledged, however, that alterations and other works may be required to keep places and objects in good repair and adapt them for use into the future. It should be noted that the addition of new structures to the registered place, as well as alterations to the interior and exterior of existing buildings requires a permit, unless a specific permit exemption is granted. Ground disturbance may affect the significance of the place and, subject to the exemptions stated in this document, requires a permit. 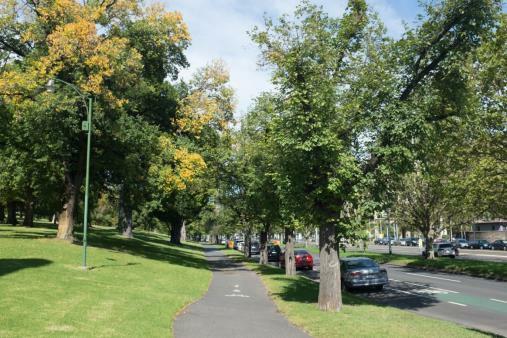 St Kilda Road is historically significant as one of Melbourne's longest and grandest major thoroughfares. For over a century this European-style boulevard has had an iconic status as the southern gateway to the city. Dating from the 1850s, St Kilda Road was developed into a magnificent tree-lined boulevard during the late nineteenth century. 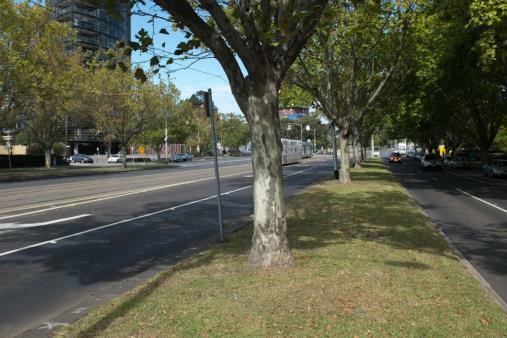 Its significance is evident across the width of the full carriage way including the grassed medians, kerbing, bluestone kerbs and channels, footpaths and consistent tree plantings. It is of aesthetic significance as a place of beauty and a visually outstanding element in Melbourne's urban landscape. 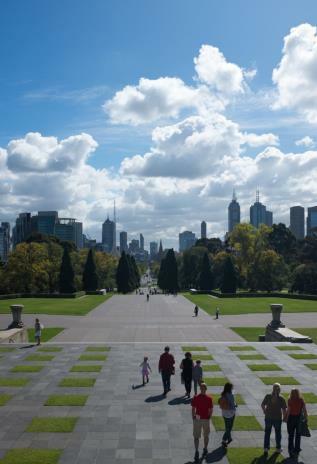 The sweeping views between the Shrine of Remembrance, St Kilda Road and Swanston Street are significant for their emphasis on St Kilda Rd as a processional route between the Shrine and the city. There are also important visual associations with the Queen Victoria Garden and Domain Parklands and Alexandra Gardens to the east.